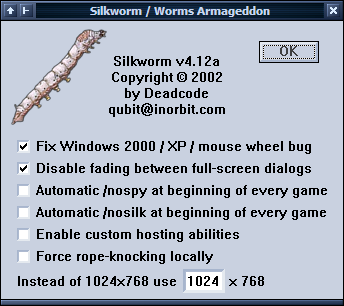 Silkworm is a companion program for the game Worms:Armageddon, written by Deadcode. The first versions of Silkworm were inclined towards cheat features. Silkworm 3.x features client-side add-ons (such as a point-and-shoot BnG aimbot), the ability to manipulate the game by directly injecting messages into the message stream (e.g. freezing time or releasing an unlimited number of Mad Cows), and "macros" such as automatic skipwalking and Parachute reselection. After a cheat version (v3.5 of 4 October 2001) of Silkworm has leaked out, WormNET was in a temporary state of chaos, because of the overwhelming cheating. In order to mitigate the chaos, Deadcode later released a version of Silkworm dubbed Antisilk - because of its ability to remotely disable cheat versions of Silkworm. It also added several enhancements to the game itself, most importantly allowing it to run under Windows 2000 and XP. This program should not be confused with the Constipated Silkworm, written by Megaworm and Annelid, which has nothing in common (perhaps but the name) with this program.